When I retired from my job late in 2011 I anticipated a lot of traveling within the state. I live near Lansing in the south central part of the lower peninsula and both my brother and mother were in failing health at that time. I knew I would be making numerous trips to their homes in the near future. One lived in the Traverse City area in the northwest part of the lower peninsula while the other lived in Chelsea, about an hour south of my home. Being the type who would rather take the road less traveled, I found a variety of ways to get to my destinations. At some point I thought I should take a picture of each town I passed through. I figured the easiest way to keep track of them would be for the picture to include the name of the town. I started at the beginning of 2012 and, as you can see by the first picture above, it didn't take long to cover the area near my brother's, my mother's and my house. Somewhere around that time in the spring of '12 I first thought to myself that it would be quite a challenge to do this for the entire state. My self said "Challenge accepted!" 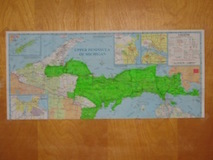 I first decided to use the AAA map to determine what towns to seek since that is what I always carry in my car. 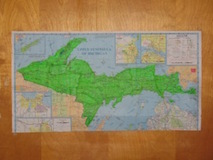 I later decided I had better take a look at the official state of Michigan map as well as there may be differences. 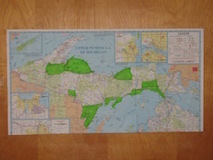 It turned out the AAA map had about 200 locations not on the Department of Transportation map but there were also more than 40 locations on the state map that weren't on the AAA Map. All together, the final tally was about 1565 locations to visit. For the most part it was something within or near the town. 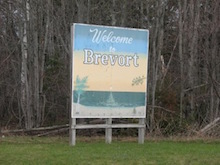 If I couldn't find something with the name, I would use the 'Welcome To…' sign if there was one as you enter the town (see Brevort above). 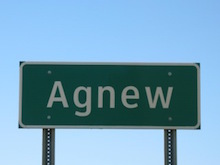 Otherwise, I used the basic state of Michigan issued sign as you come into town. These are green with white lettering and often have a white border (see Agnew). 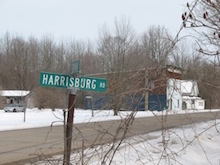 The final default was when none of the above existed except that the road going thru the non-existing town had the town's name (see Harrisburg). In these cases I took the picture at the nearest four corners where that town should be. I also broke my rules from time to time. The quality of the photos varied due to a number of factors. I would usually try to cover a predetermined area (20-30 towns) in one day. That often meant I would take my time finding a good shot in the morning but by late in the day I was taking a picture of the first thing I saw with the town's name on it. Also, when I first started this project I wasn't sure how long this whole process would take so I tended to be in a hurry. I finally slowed myself down when I calculated that I could complete my mission in about three years without making this a full time job.